The first of Mayfair’s expansions to Steam. Triple Play offers three tracks in the same pack! One side has a map of the Mid-Atlantic United States. 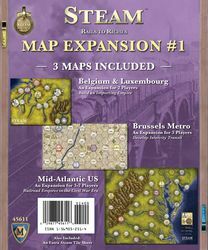 The other side has two maps: Belgium & Luxembourg and the Brussels Metro. These boards are sure to challenge Steams players with their region-specific rules and challenging topography.